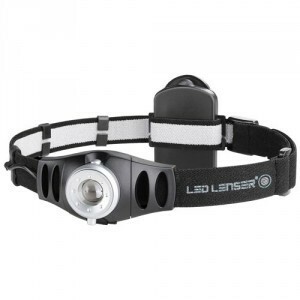 The LED Lenser H5 can do more than just look elegant. Its special optics not only focuses the light to form a super-bright long-distance beam, but also generates a dazzle-free, circular low beam. The LED Lenser H5 can do more than just look elegant. Its special optics not only focuses the light to form a super-bright long-distance beam, but also generates a dazzle-free, circular low beam. A soft headband and the fact that the lamp weighs so little make even long-time wearing really comfortable, and thanks to its red backlight, the H5 is ideal for joggers.